Data scientists in academia and industry are increasingly recognizing the importance of integrating ethics into data science curricula. Recently, a group of faculty and students gathered at New York University before the annual FAT* conference to discuss the promises and challenges of teaching data science ethics, and to learn from one another’s experiences in the classroom. This blog post is the first of two which will summarize the discussions had at this workshop. There is general agreement that data science ethics should be taught, but less consensus about what its goals should be or how they should be pursued. Because the field is so nascent, there is substantial room for innovative thinking about what data science ethics ought to mean. In some respects, its goal may be the creation of “future citizens” of data science who are invested in the welfare of their communities and the world, and understand the social and political role of data science therein. But there are other models, too: for example, an alternative goal is to equip aspiring data scientists with technical tools and organizational processes for doing data science work that aligns with social values (like privacy and fairness). The group worked to identify some of the biggest challenges in this field, and when possible, some ways to address these tensions. One approach to data science ethics education is including a standalone ethics course in the program’s curriculum. Another option is embedding discussions of ethics into existent courses in a more integrated way. There are advantages and disadvantages to both options. Standalone ethics courses may attract a wider variety of students from different disciplines than technical classes alone, which provides potential for rich discussions. They allow professors to cover basic normative theories before diving into specific examples without having to skip the basic theories or worry that students covered them in other course modules. Independent courses about ethics do not necessarily require cooperation from multiple professors or departments, making them easier to organize. However, many worry that teaching ethics separately from technical topics may marginalize ethics and make students perceive it as unimportant. Further, standalone courses can either be elective or mandatory. If elective, they may attract a self-selecting group of students, potentially leaving out other students who could benefit from exposure to the material; mandatory ethics classes may be seen as displacing other technical training students want and need. Embedding ethics within existent CS courses may avoid some of these problems and can also elevate the discourse around ethical dilemmas by ensuring that students are well-versed in the specific technical aspects of the problems they discuss. Beyond course structure, ethics courses can be challenging for data science faculty to teach effectively. Many students used to more technical course material are challenged by the types of learning and engagement required in ethics courses, which are often reading-heavy. And the “answers” in ethics courses are almost never clear-cut. The lack of clear answers or easily constructed rubrics can complicate grading, since both students and faculty in computer science may be used to grading based on more objective criteria. However, this problem is certainly not insurmountable – humanities departments have dealt with this for centuries, and dialogue with them may illuminate some solutions to this problem. Asking students to complete frequent but short assignments rather than occasional long ones may make grading easier, and also encourages students to think about ethical issues on a more regular basis. Institutional hurdles can hinder a university’s ability to satisfactorily address questions of ethics in data science. A dearth of technical faculty may make it difficult to offer a standalone course on ethics. A smaller faculty may push a university towards incorporating ethics into existent CS courses rather than creating a new class. Even this, however, requires that professors have the time and knowledge to do so, which is not always the case. The next blog post will enumerate topics discussed and assignments used in courses that discuss ethics in data science. Thanks to Karen Levy and Kathy Pham for their edits on a draft of this post. The Bitcoin blockchain — currently 140GB and growing — contains a massive amount of data that can give us insights into the Bitcoin ecosystem, including how users, businesses, and miners operate. Today we’re announcing BlockSci, an open-source software tool that enables fast and expressive analysis of Bitcoin’s and many other blockchains, and an accompanying working paper that explains its design and applications. Our Jupyter notebook demonstrates some of BlockSci’s capabilities. Current tools for blockchain analysis depend on general-purpose databases that have full support for transactions. But that’s unnecessary for blockchain analysis where the data structures are append-only. We take advantage of this observation in the design of our custom in-memory blockchain database as well as an analysis library. BlockSci’s core infrastructure is written in C++ and optimized for speed. (For example, traversing every transaction input and output on the Bitcoin blockchain takes only 10.3 seconds on our r4.2xlarge EC2 machine.) To make analysis more convenient, we provide Python bindings and a Jupyter notebook interface. This interface is slower, but is ideal for exploratory analyses and allows users to quickly iterate when developing new queries. 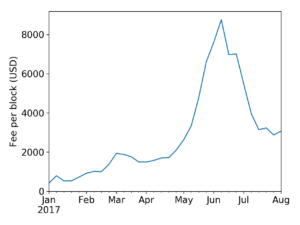 The code below shows the convenience of traversing the blockchain using straightforward Python idioms, built-in currency conversion using historical exchange-rate data, and the use of pandas DataFrames for analysis and visualization..
BlockSci uses a custom data format; it comes with a parser that generates this data from the serialized blockchain format recorded by cryptocurrency nodes such as bitcoind. The parser supports incremental updates when new blocks are received, and making it easy to stay up to date with the latest version of the blockchain. We’ve used BlockSci to analyze Bitcoin, Bitcoin Cash, Litecoin, Namecoin, Dash, and ZCash; many other cryptocurrencies make no changes to the blockchain format, and so should be supported with no changes to BlockSci. In our working paper, we present four analyses that show BlockSci’s usefulness for answering research questions. We show how multisignatures unfortunately weaken privacy and confidentiality; we apply the cluster intersection attack to Dash, a privacy-focused altcoin; we analyze inefficiencies in the usage of block space; and we present improved methods for estimating of how often coins change possession as opposed to just being shuffled around. Here’s an illustrative example. Exploratory graph analysis using BlockSci allowed us to discover a behavioral pattern in the usage of multisignatures that weakens security. Multisignatures are a security-enhancing mechanism that distribute control of an address over a number of different public keys. Surprisingly, we found that users often negate this security by moving their funds from a multisig address to a regular address and then back again after a period of a few hours to days. We think this happens when users are changing the access control policy on their wallet, although it is unclear why they transfer their funds to a regular address in the interim, and not directly to the new multisig address. This pattern of behavior has led over $12 million dollars to be left insecure over the course of over 22,000 transactions. What users may not appreciate is that the temporary weakening of security is advertised to potential attackers on the blockchain. There’s far more to explore on public blockchains. BlockSci is publicly available now, and we hope you’ll find it useful. It is easy to get started using the EC2 image we’ve released, which includes the Bitcoin blockchain data in addition to the tool. BlockSci is open-source, and we welcome contributions. This is an alpha release; we’re continuing to improve it and the interface may change a bit in future releases. We look forward to working with the community and to hearing about other creative uses of the data and the tool.